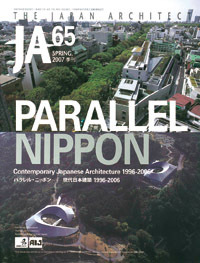 This issue was edited as an exhibition catalogue of “PARALLEL NIPPON-Contemporary Japanese Architecture 1996-2006”. Colaboration with Structural Engineersクリスタルブリックセル山下保博+アトリエ・天工人佐藤淳/佐藤淳構造設計事務所ナチュラルエリップス遠藤政樹/EDH遠藤設計室池田昌弘/MASAHIRO IKEDA Co. Ltd.
Office Tower in The Center of TokyoMARUNOUCHI BUILDINGMITSUBISHI JISHO SEKKEI Inc.DENTSU HEADQUARTERS BUILDINGOBAYASHI CORPORATION ATELIERS JEAN NOUVEL THE JERDE PARTNERSHIP INTERNATIONAL Inc.
Open Working SystemTAKENAKA CORPORATION TOKYO MAIN OFFICETAKENAKA CORPORATIONNIKKEN SEKKEI TOKYO BUILDINGNIKKEN SEKKEI Ltd.
ConversionART PLAZAARATA ISOZAKI & ASSOCIATESYAMAMOTO ARCHITECTURAL DESIGN LAB.KITAKYUSHU EX-MOJI CUSTOMS HOUSEHIDETOSHI OHNO + A.P.L. Workshop for ArtistMIRASAKA CERAMICS STUDIOHIDEKI YOSHIMATSU / ARCHIPRO ARCHITECTSWAKANOURA ART CUBETAKETO SHIMOHIGOSHI / A.A.E. Privatization and Decentralization of Media IndustryFCG (FUJI-SANKEI COMMUNICATIONS GROUP) HEADQUARTERS BUILDINGKENZO TANGE ASSOCIATESSOFTOPIA JAPAN DREAM CORETADASU OHE / PLANTEC ARCHITECTS Inc. CRYSTAL BRICKHIRO YAMASHITA + ATELIER TEKUTOJUN SATO / JUN SATO STRUCTURAL ENGINEERSNATURAL ERIPPSMASAKI ENDOH / ENDOH DESIGN HOUSEMASAHIRO IKEDA / MASAHIRO IKEDA Co., Ltd.